You're the commander of your fleet, so prepare your strategy and lead your troops to victory! Call out your coordinates and mark your hits and misses. Try to destroy your opponents fleet before they destroy yours - then remove the mission sheet from the command unit to reveal the battlefield. 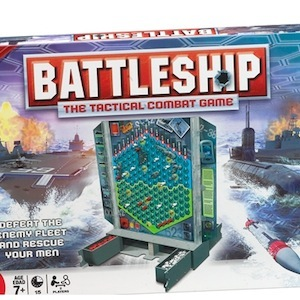 The new double-sided battle grid brings even more excitement to "Battleship!" For ages 7 and up.